The 7th-generation Hyundai Sonata debuted last year to critical and sales acclaim. Now, the 2016 Hyundai Sonata sweetens the pot with two new hybrid models, including a new plug-in hybrid that delivers up to 24 miles of EV-only range. With suspension enhancements and Android Auto rounding out the upgrades, the 2016 Sonata makes for a sophisticated and affordable midsize choice. Road noise who? A smooth car that gets the job done. Pros: quiet car, not much road noise! The acceleration really kicks when you need it, and the brakes are smooth. The screen and Sirius XM interface are solid. Bluetooth capability is great, and phone calls go straight to your car's speaker system. Trunk is decently sized. Fairly spacious, with plenty of room in the backseat. This car is a smooth ride and I love it. Cons: there was a recall on my car for a computerized mechanism that recognizes acceleration, causing the car to not "kick into high gear" so to speak. Other than that, there are no cons I can speak of. The speakers are not the greatest, but are adequate. The stock windshield wipers are only okay, but that is how all stock stuff is, right? 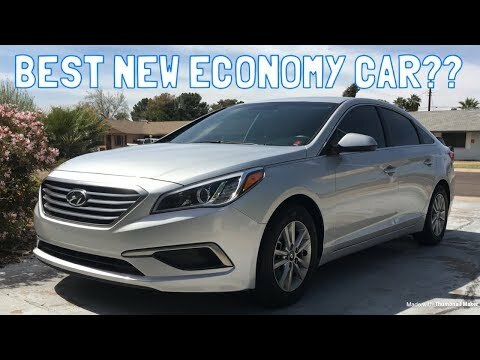 I love my 2016 Hyundai Sonata sedan! I love everything about this car except for one thing. The front driver and passenger seats are quite low. The front passenger seat is not adjustable, and the front driver's seat is but not enough. The performance is top notch. The safety is top notch. One of my favorite features is not only the back up camera but the ability to shift into manual transmission during the snowy days of winter. The gas mileage is impressive while improving depending on the type of driver's mode you select, starting with eco to sports, which I prefer on the highway. This is my third Hyundai, and I will not chose another car. Hyundai Motor Company (Hyundai) is recalling certain model year 2015-2016 Sonata vehicles manufactured May 29, 2014 to February 11, 2016, 2017 Elantra vehicles manufactured January 12, 2016 to February 22, 2016, and one 2016 Sonata Hybrid vehicle manufactured October 15, 2015. In these vehicles, the driver's frontal air bag may be missing a chemical enhancer required for the second stage air bag deployment, resulting in the second stage not deploying in certain crashes. The primary stage will deploy as intended. An air bag that does not inflate increases the risk of injury. Hyundai will notify owners, and dealers will replace the driver's frontal air bag module, free of charge. The recall began on May 5,2016. Owners may contact Hyundai customer service at 1-855-371-9460. Hyundai's number for this recall is 144. Hyundai Motor America (Hyundai) is recalling certain model year 2015-2016 Sonata vehicles manufactured May 28, 2014, to August 21, 2015. The affected vehicles are equipped with an Antilock Braking System (ABS) warning light intended to warn the driver if there is an ABS malfunction. In the event of an ABS malfunction, the Brake System warning light will illuminate, but the ABS warning light will not illuminate. Since the vehicles have ABS malfunction lights that do not illuminate, these vehicles fail to comply with the requirements of Federal Motor Vehicle Safety Standard (FMVSS) number 135, "Light Vehicle Brake Systems." If the driver is alerted there is a brake system malfunction, but not specifically with the ABS system, the driver may operate the vehicle unaware that the vehicle's brakes may lock up during hard braking, increasing the risk of a crash. Hyundai will notify owners, and dealers will update the ABS control unit software, free of charge. The recall is expected began on November 30, 2015. Owners may contact Hyundai customer service at 1-855-671-3059. Hyundai's number for this recall is 134. Hyundai Motor America (Hyundai) is recalling certain 2015-2016 Sonata and Genesis vehicles. In the affected vehicles, the warning light to indicate that the parking brake is applied may intermittently not illuminate in the dash due to corrosion in the switch. If the parking brake indicator is not illuminated when the parking brake is applied, the driver may operate the vehicle with the parking brake partially engaged, increasing the risk of a crash. Hyundai will notify owners, and dealers will replace the parking brake switch, free of charge. The recall began on August 4, 2017. Owners may contact Hyundai customer service at 1-855-671-3059. Hyundai's number for this recall is 164. Hyundai Motor America (Hyundai) is recalling certain model year 2015-2016 Sonata Hybrid vehicles manufactured December 8, 2014, to August 18, 2015, and Hyundai Sonata vehicles manufactured May 28, 2014, to March 18, 2016, equipped with the panoramic sunroof option. Due to a bonding issue with the sunroof wind deflector, the sunroof panel on the affected vehicles may detach while driving. If the sunroof detaches from the vehicle it could become a road hazard, increasing the risk of a crash. Hyundai will notify owners, and dealers will repair the wind deflector anchor plate, free of charge. The recall began December 2016. Owners may contact Hyundai customer service at 1-800-633-5151. Hyundai's number for this recall is 152. Hyundai Motor Company (Hyundai) is recalling certain model year 2016 Sonata vehicles manufactured March 28, 2016 through April 12, 2016. The affected vehicles have a driver-side frontal air bag that may not adequately protect the driver's neck from injury in the event of a crash. As such, these vehicles fail to comply with the requirements of Federal Motor Vehicle Safety Standard (FMVSS) number 208, "Occupant Crash Protection." A frontal air bag that does not adequately protect the driver's neck may increase their risk of injury in the event of a crash. Hyundai will notify owners, and dealers will replace the driver's frontal air bag module, free of charge. The recall began October 14, 2016. Owners may contact Hyundai customer service at 1-800-633-5151. Hyundai's number for this recall is 148.